"All that has dark sounds has duende, that mysterious power that everyone feels but no philosopher can explain." Frederico Garcia Lorca mused on the inexplicable sadness that lives at the heart of certain works of art. Cave claimed that duende needs “space to breathe” – Sydney’s State Theatre with its Gothic, Italian, and Art deco adorned walls offered ample breathing space on four consecutive nights this December (11th-14th). 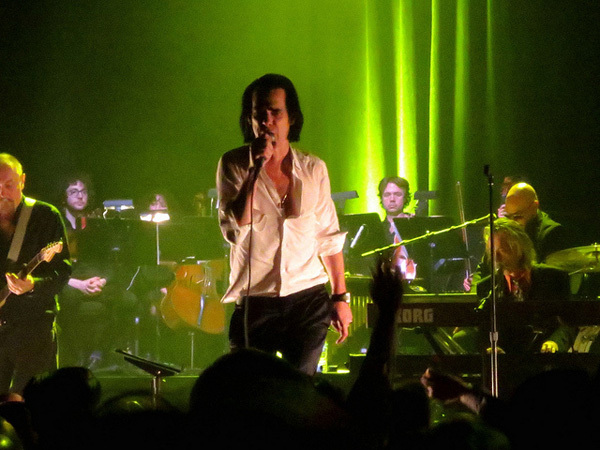 Your humble narrator has had the pleasure of seeing Nick Cave hold court on three continents in various locations in a variety of incarnations. This time it was him in the usual well-tailored suit and the Bad Seeds in chamber ensemble formation and, again, they did not disappoint. An eclectic evening of hushed moments interrupted by short glimpses of the natural force that the Bad Seeds are when they bring out the heavy artillery and fire on all cylinders in rock mode. Cave prowled the stage in a manner that would make the most prominent figures in the expressionist movement of German 1920s-era cinema paler than Nosferatu himself, while having his tongue placed firmly in cheek when the audience’s adoration seemed to become a bit too overwhelming. Warren Ellis has become his right-hand man and in conjunction with a rhythm section capable of effortlessly shifting moods, heightened with quieter moments of minimalist dissonance the impact of the heavier passages, accompanying Cave’s crooning at times with blasts of atonal, howling feedback. ‘Twas a grand evening beyond genres or comparison. Until the next time . . .